Several years ago I worked for a cellphone company. One day it was announced that we would be carrying a new product. It was larger than a cellphone but smaller than a computer. It was flat and was mostly a glass screen. You could not make calls with it. It did not have a physical keyboard. Instead it was entirely controlled by touch. I thought at the time, “This is the most ridiculous thing I have ever seen. We’ll never sell these things.” I might have underestimated the appeal of the tablet. Recognizing my own weaknesses in telling the future, I read Superforecasting with great interest. I was not disappointed! Tetlock and Gardner share insights from years of research with people who have proven themselves to be extraordinary predictors. Not perfect, but much better than average. These are not your news/talk pundits who predict with great certainty what will happen tomorrow, then tomorrow explain with equal certainty why they knew it was not going to happen after all. These are people who volunteered at www.goodjudgment.com to take a series of tests, then participate in a long running study of what goes into making good predictions. This project is ongoing, and new volunteers are welcome. What sets great forecasters–”superforecasters”–apart from others may be surprising. These are not people who are necessarily possessed of a genius IQ. They are smart, but not always in ways measured by standardized tests. They are not always people with the highest education levels, though most of them did go to college and many completed graduate and doctoral programs. They are not people whose jobs or education prepared them for this. They include housewives and artists, scientists and bureaucrats, and many more walks of life. But they do have certain things in common. 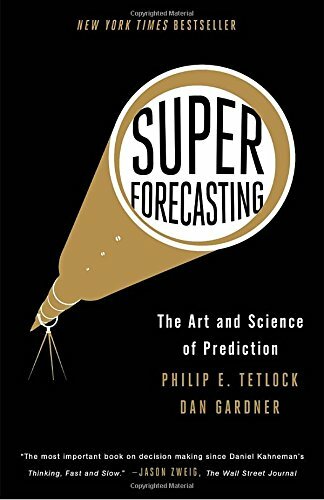 Tetlock and Gardner identify several aspects that comprise the “composite portrait” of a superforecaster. They are cautious, humble, and non-deterministic in outlook. They are actively open-minded, intelligent and knowledgeable, reflective, and numerate (comfortable with numbers). They tend to be pragmatic, analytical, “dragonfly-eyed” (valuing diverse views and synthesizing them into their own), probabilistic (judge using degrees of “maybe”), thoughtful updaters, and good intuitive psychologists. And in their work ethic they have a growth mindset (believing it’s possible to get better) and grit. Not all of these characteristics are weighted equally, but all of them bear on a person’s ability to accurately predict outcomes to challenging questions about the future. Superforecasting also offers helpful advice to improve the reader’s ability to improve her forecasting talents. Triage is important: weeding out questions that are either too easy to answer or impossible to answer. Choose questions that provide a challenge but are indeed answerable within an appropriate time. Break large problems into smaller, easier to answer questions. Strike a balance between inside and outside views. Avoid under- or overreacting to new information. Look for clashing causal forces at work. There are others, but the concluding advice sums up much of the book: Don’t treat commandments as commandments. Each case is different, and no set of guidelines will work for every situation. Including these guidelines! Superforecasting was interesting and informative. It kept my attention throughout and I learned a lot. I can’t say I will predict the next “tablet” invention to sweep the world. But I do know a bit more about analyzing my own predictions with humility and information, so maybe I won’t be quite so quick to dismiss the next tablet, either.